Operation Northwoods was a proposed, and almost implemented, false flag operation against the Cuban government that originated within the U.S. Department of Defense (DoD) and the Joint Chiefs of Staff (JCS) of the United States government in 1962. The proposals called for the Central Intelligence Agency (CIA) or other U.S. government operatives to commit acts of terrorism against American civilians and military targets, blaming them on the Cuban government, and using it to justify a war against Cuba. The plans detailed in the document included the possible assassination of Cuban émigrés, sinking boats of Cuban refugees on the high seas, hijacking planes, blowing up a U.S. ship, and orchestrating violent terrorism in U.S. cities. The proposals were rejected by John F. Kennedy. The main proposal was presented in a document titled "Justification for U.S. Military Intervention in Cuba (TS)," a top secret collection of draft memoranda written by the Department of Defense (DoD) and the Joint Chiefs of Staff (JCS). 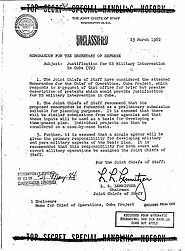 The document was presented by the Joint Chiefs of Staff to Secretary of Defense Robert McNamara on 13 March 1962 as a preliminary submission for planning purposes. The Joint Chiefs of Staff recommended that both the covert and overt aspects of any such operation be assigned to them. "Appendix to Enclosure A" and "Annex to Appendix to Enclosure A" of the Northwoods document were first published online by the National Security Archive on 6 November 1998 in a joint venture with CNN as part of its 1998 Cold War television documentary series—specifically, as a documentation supplement to "Episode 10: Cuba," which aired on 29 November 1998. "Annex to Appendix to Enclosure A" is the section of the document which contains the proposals to stage terrorist attacks. Since it would seem desirable to use legitimate provocation as the basis for U.S. military intervention in Cuba, a cover and deception plan, to include requisite preliminary actions such as had been developed in response to Task 33 c, could be executed as an initial effort to provoke Cuban reactions. Harassment plus deceptive actions to convince the Cubans of imminent invasion would be emphasized. Our military posture throughout execution of the plan will allow a rapid change from exercise to intervention if Cuban response justifies. 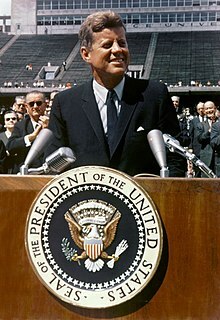 Kennedy personally rejected the Northwoods proposal. A JCS/Pentagon document (Ed Lansdale memo) titled MEETING WITH THE PRESIDENT, 16 MARCH 1962 reads: "General Lemnitzer commented that the military had contingency plans for U.S. intervention. Also it had plans for creating plausible pretexts to use force, with the pretext either attacks on U.S. aircraft or a Cuban action in Latin America for which we could retaliate. The President said bluntly that we were not discussing the use of military force, that General Lemnitzer might find the U.S. so engaged in Berlin or elsewhere that he couldn't use the contemplated 4 divisions in Cuba." The proposal was sent for approval to the Secretary of Defense, Robert McNamara, but was not implemented. 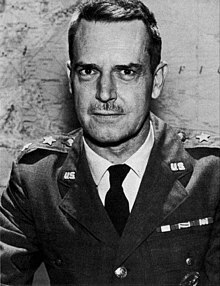 Following presentation of the Northwoods plan, Kennedy removed Lemnitzer as Chairman of the Joint Chiefs of Staff, although he became Supreme Allied Commander of NATO in January 1963. U.S. military leaders began to perceive Kennedy as going soft on Cuba, and the President became increasingly unpopular with the military, a rift that came to a head during Kennedy's disagreements with the service chiefs over the Cuban Missile Crisis. ^ a b c U.S. Joint Chiefs of Staff, "Justification for US Military Intervention in Cuba (TS)", U.S. partment of Defense, 13 March 1962. The Operation Northwoods document in PDF format on the website of the independent, non-governmental research institute the National Security Archive at the George Washington University Gelman Library, Washington, D.C. Direct PDF links: here and here. ^ News, A. B. C. (7 January 2006). "U.S. Military Wanted to Provoke War With Cuba". ABC News. ^ Ruppe, David (May 1, 2001). "U.S. Military Wanted to Provoke War With Cuba". ABC News. Retrieved January 21, 2012. ^ Jim Wolf, "Pentagon Planned 1960s Cuban 'Terror Campaign'," Reuters, 18 November 1997. ^ a b Mike Feinsilber, "At a tense time, plots abounded to humiliate Castro," Associated Press (AP), 18 November 1997; also available here. ^ "The Records of the Assassination Records Review Board," National Archives and Records Administration. ^ "Media Advisory: National Archives Releases Additional Materials Reviewed by the Assassination Records Review Board," Assassination Records Review Board (a division of the U.S. National Archives and Records Administration), 17 November 1997. A U.S. government press-release announcing the declassification of some 1,500 pages of U.S. government documents from 1962 to 1964 relating to U.S. policy towards Cuba, among which declassified documents included the Operation Northwoods document. ^ a b Tim Weiner, "Documents Show Pentagon's Anti-Castro Plots During Kennedy Years," New York Times, 19 November 1997; appeared on the same date and by the same author in the New York Times itself as "Declassified Papers Show Anti-Castro Ideas Proposed to Kennedy," late edition—final, section A, pg. 25, column 1. ^ "National Security Archive: Cold War: Documents," National Security Archive, 27 September 1998 – 24 January 1999. ^ U.S. Joint Chiefs of Staff, "Appendix to Enclosure A: Memorandum for Chief of Operations, Cuba Project" and "Annex to Appendix to Enclosure A: Pretexts to Justify U.S. Military Intervention in Cuba," U.S. Department of Defense, c. March 1962. First published online by the National Security Archive on 6 November 1998, as part of CNN's Cold War documentary series. "Annex to Appendix to Enclosure A" is the section of the Operation Northwoods document which contains the proposals to stage terrorist attacks. ^ "Cold War Teacher Materials: Episodes," Archived 2007-01-26 at the Wayback Machine and "Educator Guide to CNN's Cold War Episode 10: Cuba," Archived 2007-01-26 at the Wayback Machine Turner Learning (Turner Broadcasting System, Inc.). ^ "Pentagon Proposed Pretexts for Cuba Invasion in 1962," National Security Archive, 30 April 2001. ^ a b c d James Bamford, Chapter 4: "Fists" of Body of Secrets: Anatomy of the Ultra-Secret National Security Agency From the Cold War Through the Dawn of a New Century (New York: Doubleday, first edition, 24 April 2001), ISBN 0-385-49907-8. ^ Mike Feinsilber, "Records Show Plan To Provoke Castro," Archived 2005-08-24 at the Wayback Machine Associated Press (AP), 29 January 1998. ^ "Statement by the National Assembly of People's Power of the Republic of Cuba," National Assembly of People's Power of Cuba, 3 August 2001; also available here. This page was last edited on 8 April 2019, at 23:37 (UTC).